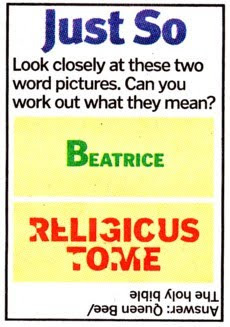 Have a look at the second of these “word picture” puzzles in yesterday’s London Lite. It consists of the words RELIGIOUS TOME perforated with a number of holes. The answer is “The holy bible”. It depends, then, on the homophony of hole-y (full of holes) and holy (sacred). But they are not homophones for the many speakers in England who use a special allophone [ɒʊ] for /əʊ/ before morpheme-final /l/. (These are the people for whom a goalie, where the /l/ is morpheme-final, doesn’t really rhyme with slowly, where it is morpheme-initial.) I think everyone probably pronounces hole-y identically with wholly. In both the /l/ is treated as morpheme-final. But in holy it isn’t. I discussed this in my blog of 31 July 2006, and will repeat here what I wrote then. I recounted how, when I was a small boy and couldn’t sleep one night, my father told me the Bible story of Moses and the burning bush (Exodus 3). In the words of the Authorized Version, God spake unto Moses from out of the midst of the bush and said, “Draw not nigh hither: put off thy shoes from off thy feet, for the place whereon thou standest is holy ground”. This implies that my late father pronounced [ˈhəʊli] holy ‘sacred’ and [ˈhəʊli] hole-y ‘containing holes’ identically — like me, and unlike the speakers mentioned above. For me, wholly has distinctly geminated [l], so holy and wholly are minimal pairs even though the vowel [oʊ] is the same. For me, "goalie" and "slowly" don't rhyme, but "holy" goes with "goalie". I think I also have a geminate in "wholly". I (and my wife) also have a geminate [l] in "wholly". I think if I used the word more it probably would have undergone some reduction, but since I almost never use it it still comes out a long /l/. I too have what I'd transcribe as ['hɒul,li] for "wholly". I have ['houli] for "holy", and I think that's what I hear from others (it's hard to be sure, as it's not a word I hear often). Though we're comparing the GOAL vowel to the GOAT vowel, in a sense it's an allophone of the short o rather than of the long o, as shown by the spelling of some of the words it occurs in: with o followed by 2 consonants, such as old. Being a diphthong, it is not necessarily a composite of two single-vowel phonemes. (...This is something that pedants mark explicitly, either by deciding which part of it is subsyllabic and slapping an inverted breve, ̯, under it, or by using the tie bar , ͡ ; not doing so requires the reader to know which diphthongs occur in the language that is transcribed.) For instance, my German /aʊ̯/ starts with a central rather than a front vowel, even though my /a/ is always front, and my... let's call it /aɪ̯/ starts not with the sound of /a/ and not quite with that of /ɛ/ either, but with a (slightly) even more open sound. For the sake of completeness (if not unfettered rambling), it does of course occur that a diphthong consists of two sounds that occur as separate phonemes in the same language; it's just not the only option. As far as I know, in all accents where it hasn't merged into something else (such as /yː/, /aɪ̯/, or /aɪ̯l/), the German /ɔɪ̯/ really does consist of the sound of /ɔ/ followed by that of /ɪ/. You'll see it written "/ɔʏ̯/" in some sources; that's meant to be a transcription of those accents where /ɪ/ has [ʉ] as (at least?) an allophone. FWIW, I grew up (in England) with split "wholly"/"holy" as described by JW. They are very very slowly coming back together again, under the influence of local California speech which has [oʊ] for both. This is reinforced by my early childhood choral training where we were taught to use [oʊ] for all "goat" words, probably because of the innate conservatism of choral singing and because [əʊ] is not euphonic. I am an Australian speaker who has allophone [ɔu] for /əʉ/ in "wholly" but not in "holy". Many Australians, however, have that allophone in a much wider range of pre-/l/ environments than I do, including words like "cola", "solo", "Poland", etc. (I'm not so sure about "slowly".) I use [əʉ] for all those. Both groups have the allophone in at least some pre-/l/ environments; the difference lies in whether it occurs only when the /l/ is morpheme-final, or more generally. ...That was of course nonsense, because [a] is more, not less, open than [ɛ]. I did mean something slightly more open than [ɛ] (still closer to it than to [æ]), but of course [a] is more open still. "I think everyone probably pronounces hole-y identically with wholly. In both the /l/ is treated as morpheme-final." I think you may be alone and palely loitering in that belief, John! I would be quite capable of not geminating in 'palely', but I would never rhyme it with 'daily'. For me, and I suspect you, 'palely' has a much levelled diphthong, following 'pale' whereas of course 'daily' has perhaps not so fully-fledged a diphthong as 'day', but it is still distinctive with respect to the one in 'pale'. As in every other branch of linguistics we are operating with a Procrustean bed: 'really', 'fully' etc. fit the non-geminated one perfectly, but 'solely', 'cruelly', even 'vilely', etc. come in all shapes and sizes of non-gemination. So it is with 'wholly'. But it is vilely complicated. For me 'whole' rhymes with 'hole' but 'wholly' rhymes with 'holy' as well as 'holey', but is still distinctive as a lexical item with respect to both, inasmuch as it may be geminated, for emphasis mostly. This means it is homomorphous with them but not homonymous. And I too could have had the anecdotal problems with the 'holy ground': 'holy' and 'holey' are totally homonymous for me. The Estuarine respect for morphology as in paws~pause or whatever is a moral vacuum for us, and so they both have the same syllable structure. All this is more or less the norm in my elderly experience. True, it is so elderly that my allophone before [l] is [öʊ] rather than [ɒu], but it's still capable of carrying the burden of phonologically and semantically distinctive function! "For me, "goalie" and "slowly" don't rhyme, but "holy" goes with "goalie". Daniel Jones gave the examples 'tide' and 'tied' for Sc., proposing to distinguish them as [təid] and [taed], and although there are other phonological reasons for that opposition in Sc, the phenomenon is too widespread to have phonological oppositions to fall back on in most cases. Richard Sabey, JW said somewhere how widespread the idea is that this –ol- phenomenon is an allophone of the short o rather than of the long o, but you can't assume anything is "shown by the spelling of some of the words it occurs in: with o followed by 2 consonants, such as old." Least of all in English! What about "bowl"? It's obviously because the [ɒu] allophone sound like short 'o' followed by a glide to an 'l' which itself may be in some vocalic guise. Actually if anyone thinks it's an allophone of the short o, it probably means they have completely lost the opposition in that context, and you can't say what it's an allophone of! This is what the concept archiphoneme is for. It's an allophone of that. JW points out that this is undoubtedly why people started to hypercorrect words like revolve from short to long o if they were still capable of making the distinction there. People our age are probably still having to learn to live with that, but I don't think I will ever come to terms with alcohole and aerosole etc. David Marjanović, whereabouts are you from? I still seem to hear mostly [ɑʊ]. But re "maybe my understanding of [ə] is too narrow. :-)", maybe most people's is! As Richard Sabey says it's not otherwise used in nuclear position in BrE, though US phoneticians seem to have no problems with it there. It's only really for phonetic reasons that we use ʌ. But because we do, we were able to choose not to use [ʌʊ] for the GOAT vowel, and thus avoid giving people funny ideas about RP! "You'll see it written "/ɔʏ̯/" in some sources; that's meant to be a transcription of those accents where /ɪ/ has [ʉ] as (at least?) an allophone." You've lost me there. It still sounds like that to me. With [ʏ] as an allophone of /y/, which is what you would expect of an umlauted reflex of the etymological u.
I see I should have made it clear that when I do geminate in 'wholly', the treatment of the /l/ as morpheme-final comes bouncing back, and I have the same o as in whole or hole. My pronunciation of 'wholly' as 'holy' is wholly allomorphic in origin. Funny how you never get gemination or morpheme-final treatment of the /l/ in 'really', isn't it? Or do you? The two would go together, wouldn't they? David Marjanović, whereabouts are you from? As Richard Sabey says it's not otherwise used in nuclear position in BrE, though US phoneticians seem to have no problems with it there. Try to find the thummer on Language Log. That's someone who says [ðʌm] when he wants to emphasize "them", as in "don't give it to me, give it to them! ", the example sentence of which a sound file is included in the Log entry. Obviously there are people out there who have [ʌ] and [ə] as stressed and unstressed allophones of the same phoneme. Incidentally, the vowel that guy uses for [ʌ] is the one I was taught to use; it's different from the real [ʌ] of Russian. You've lost me there. It still sounds like that to me. And indeed in does in, I think, northern Germany in general. which is what you would expect of an umlauted reflex of the etymological u. Interesting point. Yes, that's what we'd expect for äu, the Umlaut of au, but not for eu. It's entirely possible that these two spellings merged in different ways in different places. Thank you, David. An informative post. Yes we Europeans must keep our end up against the dread thummers. The way I think of it is that they will have no truck with full-blown allomorphic variance such as [ðɛm] and [ðəm] between strong and weak forms, and want to keep life simple by reducing the difference from the overwhelmingly commoner weak form to an allophonic one determined by sentence stress. But David, are you sure that the vowel that guy uses for [ʌ] is the one you were taught to use? (What makes the [ʌ] of Russian so real in this uncertain world?) Are you sure it's not the opposite case of using [ʌ] for the vowel that guy uses? You say "There's /ʏ/, and there's /yː/..." but I did put the first between square brackets and the second between solidi, with no length mark. You seem very sure that they are two distinct phonemes! And yes, the orthography has never been quite sure what it wanted to do with au, äu and eu. Yiddish sorted it out just fine, didn't it? But David, are you sure that the vowel that guy uses for [ʌ] is the one you were taught to use? What makes the [ʌ] of Russian so real in this uncertain world? [ʌ] is supposed to be the same as [ɔ] except for lacking rounding. As far as I can tell, that's true for the Russian one, but not for the English one I was taught (which is a bit more open and probably pharyngealized or something). I speak Standard German, so I know an [ɔ] when I hear one. You say "There's /ʏ/, and there's /yː/..." but I did put the first between square brackets and the second between solidi, with no length mark. Yes, and that confused me. That's because height and length come as a package in German. But I can't see any problems with au. Not sure what you mean about Yiddish, but that's about as complex as in German dialects in space and time, and orthographical conventions make it even more difficult. David, wouldn't it be wonderful it things were what they were supposed to be? [ʌ] is of course supposed to be the same as [ɔ] except for lacking rounding. And [ɔ] is NOT supposed to be what I got bawled out for using [ɒ] for in AmE re Spouses. But it now appears that by "the real [ʌ] of Russian" you meant "the cardinal [ʌ] of Russian" which I am happy to believe you were taught. But I needed clarification. I take it you are talking about the pre-tonic reduction of o and a, and I grew up with [a] for that. I trust the [ɔ] is still strongly rounded, with a downward projection of the lips! I am also happy to agree that that's not true for the English [ʌ]. I do like your description "a bit more open and probably pharyngealized or something". Most refreshing, for who can say what it is? Sorry it confused you that I put the ʏ between square brackets and the y second between solidi, with no length mark. I did that because I am quite aware that height and length come as a package in German. Phonetically speaking, that is. There is obviously no functional opposition between the [ʏ] of [ɔʏ] and the [y] of [y:] with respect to either quality or length. Yes, I do know about the sound shift when I say Yiddish sorted it out just fine, but I was talking about the orthography of au, äu and eu, wasn't I? Which have all three merged, with no nonsense about not reflecting that merger in the spelling. So Yiddish certainly doesn't have any problems with au, and neither it appears do you or I. But it now appears that by "the real [ʌ] of Russian" you meant "the cardinal [ʌ] of Russian"
In Russian? /a/ isn't reduced in Russian, at least not that much. I trust the [ɔ] is still strongly rounded, with a downward projection of the lips! Which language are you talking about here? Russian lacks [ɔ] altogether. – In Russian? /a/ isn't reduced in Russian, at least not that much. Well I did say I grew up with [a] for that in Russian, and of course for the tonic a. The pre-tonic is remarkably clearly articulated, but I would still have liked a bit of your confetti even then. Are you saying you are happy with that but use [ʌ] for the pre-tonic o? I still think I must be under some sort of misapprehension! – I trust the [ɔ] is still strongly rounded, with a downward projection of the lips! – Which language are you talking about here? Russian lacks [ɔ] altogether. This strikes me as another example of being wedded to one phoneticization. There is no opposition between [o] and [ɔ] in Russian, so people have been inclined not to bother with [ɔ], and indeed typical realizations do seem acoustically closer to [o], but I have always thought that was because of the extreme labialization. I have always thought that was because of the extreme labialization. That's indeed a possibility I haven't taken into account. It's not a pure monophthongal [o] in any case. Are you saying you are happy with that but use [ʌ] for the pre-tonic o? Yes. Two similar but different vowels, in total, occur in фотоаппарат (stress, and therefore some length, on the last syllable). Quite an education! Cm'on, gi's that in IPA! I want to frame it for my study wall, and I want it absolutely right. [fʌtʌapaˈraˑt]. I'm not sure if the [p] is long (double-spelled consonants only occur in loans and across morpheme boundaries in Russian, and tend to be pronounced as long, but I didn't pay attention to that). Five syllables. Do please find a real live naïve Russian speaker to say that! I thought you might give me [fətʌapaˈraˑt]. You did say stress on the last syllable, and I would have thought it odd for Russian to recognize the bimorphemic structure by giving it any sort of subsidiary stress. So I really don't know what's going on here, and I sort of wonder if whatever it is, your teacher was exaggerating it. Time was when I would have been happy with [fətəəpaˈraˑt], and if you still allow me to write ə where you write ʌ, I could imagine using ʌ for some sort of transition between the vowel of tə and the vowel of pa, and to give an indication of some sort of onset I think there may be between the two consecutive vowels. Like this: [fətəʌpaˈraˑt]. Don't give up on me! You do agree it's fascinating, don't you? But am I right in understanding your emoticon to mean that you're not interested in reality checks? Nevertheless, not having seen this till after my marathon post on the 'blancmange' thread in answer to your question about functional ordering, I still thought it worth the effort, and so conceivably may you. Perhaps you didn't see my last post on 'more old nonsense' in which I appealed for more intersubjectivity. I'll check out the other two posts. How do you spell that address again?